This cozy and atmospheric holiday home is located in the gorgeous Eilandspolder nature reserve. The lovely holiday home is beautifully situated and has been furnished with all conveniences and comforts to make your holiday a memorable one. The nice airy living room has a view on to the Schermerring canal. There is a cozy atmosphere in the home thanks to the lovely sitting corner with the open fire place. The kitchen with the dining room is a step down from the rest, connected by stairs to the living room. The garden, accessible through the folding doors from the kitchen, is the place to enjoy the outdoor life. The bathroom has a rain shower and a jacuzzi. 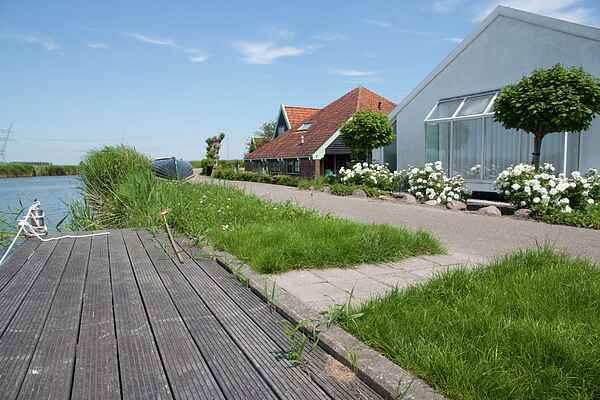 Situated at the gorgeous nature reserve \"Eilandspolder\", between Alkmaar and Amsterdam, it is the place to enjoy peace and quiet. There are many quaint little lakes in front the house as well as in back. The nature reserve can be explored by barge or boat, you can rent one at the home by the week. On the dikes and throughout the area there are lots of bike and walking paths. Places such as the Rijp and Driehuizen still exude the old authentic atmosphere. Do visit the Museum and Beeldentuin Nic Jonk, only 200 meters away. An inspiring and unique location filled with art.